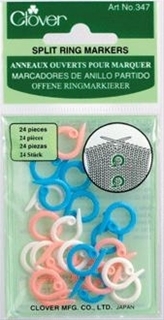 Clover Double Ended Stitch Holder. Contains two 6 1/2 inch (165 mm) stitch holders for needle sizes #5 - 11 (3.75 - 8 mm). Colors may vary.